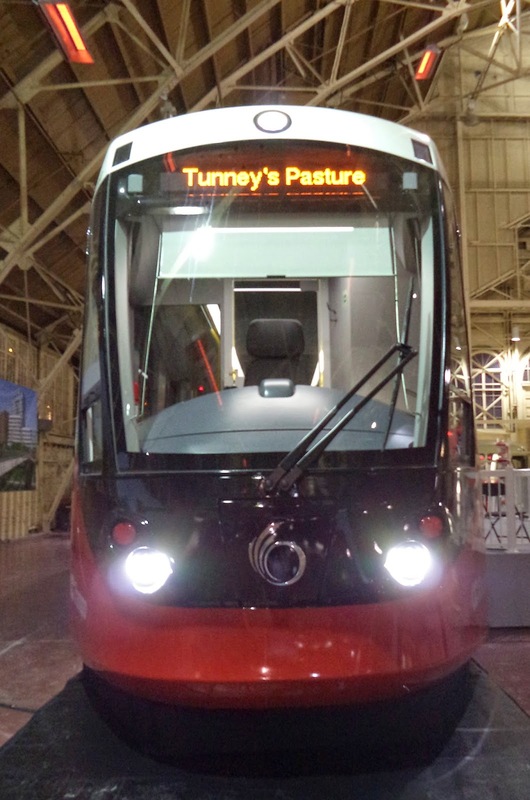 Over the weekend, I made a visit to Lansdowne Park to check out the mock-up of the new Alstom Citadis Spirit light rail vehicle that will be servicing the future Confederation Line. The length of the mock-up is about a third of a "car", but it's enough to get an idea of what you will be riding in 2018. Each set of doors has a green button on both sides to open allow passengers to enter and exit. During the winter and summer months, opening the doors only as necessary will help reduce the cold or warm air coming in at outdoor stations. The blue and dark square pattern of the seats appears to be consistent with the colour scheme of the seats on the O-Train Bombardier trains. Cooperative seating is faced sideways with all of this spacious standing room in between. Each car will have four areas for mobility devices. The aisle looks wide enough for people to squeeze by to exit or find a seat. But if you go further down the train (in either direction), the aisle narrows to a similar width as an articulated bus aisle before the bend. When a train is full during rush hour, passenger flow will be a challenge. Getting by someone or allowing someone to get by you will feel uncomfortable just like on an articulated bus. Dwell times will be longer during rush-hour anyway, but poor passenger flow will only make them longer. Below, this area has few poles to grab onto if you do stand. The lack of an overhead horizontal bar will only create pockets of unused standing space where there are no vertical bars. One can hope that an overhead bar can be added later. If there's one thing that wasn't overlooked, it's the safety features. Each car will have six passenger intercoms for emergency use. Right above the intercom is a message screen for displaying station names, public service announcements, and emergency messages. These messages will also be shown overhead at the accordion part of the train. At the top, there's an emergency door release and right across, also near a set of doors, a security camera is installed. These are only my initial observations of a model, which can't be compared to a moving train with passengers on board. You can view and step inside the mock-up on any day of the week from 8 a.m. to 8 p.m. in the Aberdeen Pavilion at Lansdowne Park until March 31.